Once you have selected your hearing aid(s), an appointment will be scheduled for hearing aid fitting. At this appointment, the audiologist will confirm the size and fit of the hearing aid(s) to your ear(s). Demonstration on how to use the devices, how to put them in the ear and how to remove them, how to change batteries, and how to care for and clean the devices will be provided during the fitting session. It is also a good idea to bring family members or close friends to the hearing aid fitting so they can help remember all the information that are educated in the fitting session. To be advised, it shall take some time to get used to the sounds you were missing, and by working closely with our audiologist, you will get the most out of your new hearing aids. Follow-up appointments for digital hearing aids are necessary as tofine tune the hearing aid sound levels and make it more comfortable for use. Post pediatric audiology assessment, if hearing loss is inferred through the child’s audiology report, pediatric hearing aids will be suggested. This is a best solution available to treat hearing loss in pediatrics. The purpose of a pediatric hearing aid is not to reinstall the lost hearing power whereas it ensures that the child hears soundregularly, to identify various sounds and to support the hearing level from further deterioration. 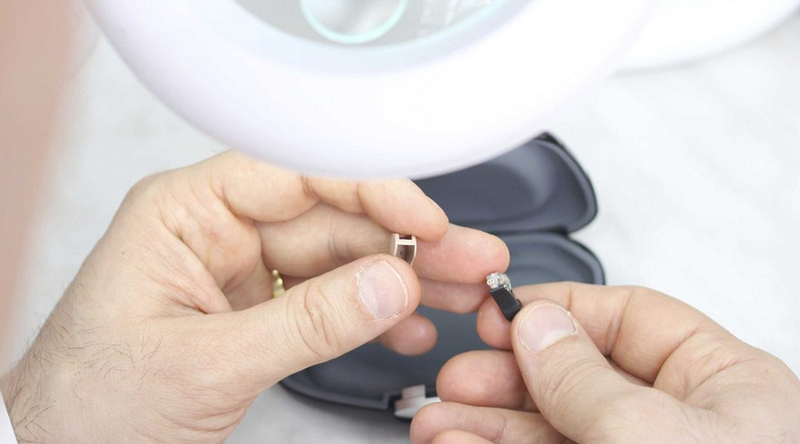 Hearing aids have small working parts, and it is not uncommon over time for a hearing aid to need a repair, even when it is cared for and maintained appropriately. If you should experience an issue that needs repair, take the hearing aid to a nearby hearing care professional. You find a nearby professional in Ausy. If you are hailing from Chennai, Ausy has a full fledged hearing aid service centre in Chennai. If you are from any other part of the country contact us, we will guide you accordingly. Minor hearing aid repairs can be done in the office in a short period of time; other hearing aids will need to be sent to the manufacturer for repair. Your hearing professional can help determine what kind of a repair is necessary if you feel your hearing aid is not working properly. We are able to service hearing aids of leading hearing aid manufacturers and can tell you in the office if yours is a brand we service. Hearing aids come with a warranty when purchased new. If your warranty has expired, it is still possible to repair most hearing aids with a small fee. Depending on the hearing aid manufacturer, this repair may come with a new year-long warranty. Your hearing professional will provide you with details when you take your hearing aid into the office.